What ?!?!? Hope you weren't expecting to see Will Smith fighting the aliens here! We are actually featuring crafty creations showcasing "Independence Day" ... the holiday! through a Close to My Heart consultant. If you don't already have a Consultant that you are currently working with, please contact one of the Consultants in our hop with any questions you have! 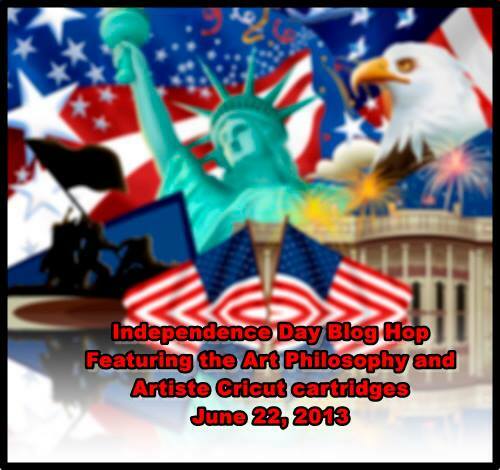 In this hop, you will see projects featuring this versatile cartridges from many talented crafty ladies! Enjoy our blog hop! If you have just hopped onto my blog, please start at the beginning at Lucy's blog – Love 2 Create . If you came from "Lucy ~ Love 2Create" then you are in the right place! My Cricut cut is the star, cut from the cricut cartridge Art Philosophy. The star is the negative piece from the card that can be found on the letter "L". I used 3D foam tape to pop up the star, and I used the home of the brave stamp set. (which is on special this month. You can find info on it here.). My daughter Alayna who is 4, helped choose the colors for the card. I asked her what color we should stamp the Statue Of Liberty in, and she chose lagoon. She has never actually seen the Statue Of Liberty, so it was kind of funny that she chose a color that resembles it. The flag pole is stamped in black, and my daughter Sidney chose the cranberry for the stars, and outdoor denim for the words. I had fun making this card with my daughters. Your next stop on our Independence Day hop is "Michelle" of " My Flights of Fancy ". Fun...simple and love how you kept patina color on statue! Great card! The colors are perfect! I'm a new follower. Stopping by from the Celebrate Freedom Blog Hop! Love the card! The Everythings's ABC's letter "L"
The everything's ABC's blog hop letter "K"